Welcome to the rodeo! 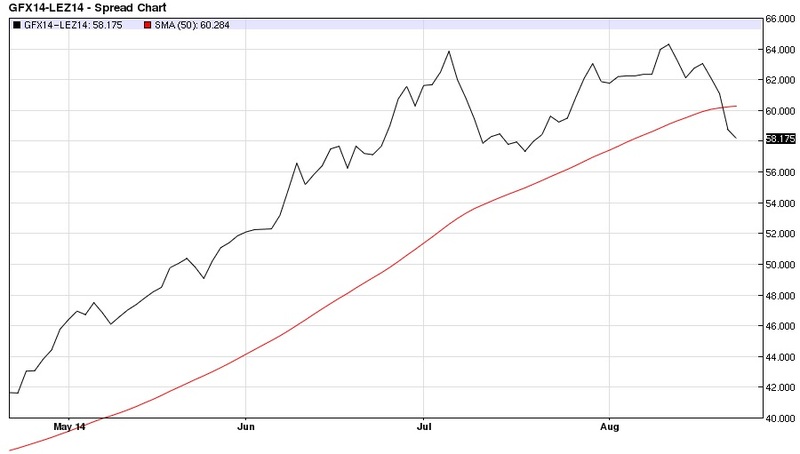 On August 21st, just a day after our very first post, the Nov-Dec feeder/live cattle spread closed below the rising 50-day Moving Average for the first time in over four months. This triggered a hypothetical trade for the blog to sell one 50,000 lb. November feeder cattle contract at 207.35 and buy one 40,000 lb. December live cattle contract at 148.60 for a spread of 58.75 (premium feeders). The contract high for the spread was made on August 12th at 64.30. Therefore, our initial hypothetical position exit signal will be a two-consecutive day close above 64.80 (or .50 points above the contract high). Note that the tick value of $5 on the feeder cattle contract is slightly higher than the tick value of $4 on the live cattle contract. To normalize the tick size, a trader should have four feeder contracts for every five live cattle contracts. Once a downtrend is firmly established in the Nov-Dec feeder/live cattle spread, we may discuss potential ideas for measuring volatility to determine intervals for adding to a spread position. Stay tuned! ← Almost Time to Take the Bull by the Horns?